Train Science – Download FREE Printable Reading Comprehension Science Worksheets for Kids. Our word search puzzle sheet on trains is great for Primary school kids in Grades 1-5. Primary & Grammar school kids can enjoy this fun word searches game as a reading comprehension activity. Pre-K and Kindergarten kids can use this preschool train science worksheet as a listening comprehension tool. Your kids can have fun learning facts about trains with this word search puzzle. At the same time, this game can also improve their reading skills. Our Easy Science Facts for Kids website is a great parent resource for science activity sheets, with many more FREE word games, fun science for kids printables, word search puzzle games and fun word searches games. What are trains? Trains are common means of transportation. These vehicles can transport people and goods to other places. There are different kinds of trains. There are railroad trains and underground trains. If you want your child to learn more about trains through train science activities for preschoolers, download the printable easy science worksheet! 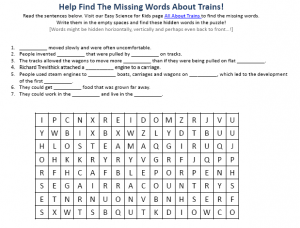 [sociallocker]Download the printable hidden words puzzle game worksheets all about trains. Download the Train Science Worksheet! Liked the Train Science worksheet for kids? Click for lengthy information on trains here. Declan, Tobin. " Train Science- Download FREE Printable Reading Comprehension Science Worksheets for Kids - ." Easy Science for Kids, Apr 2019. Web. 26 Apr 2019. < https://easyscienceforkids.com/train-science-download-free-printable-reading-comprehension-science-worksheets-for-kids/ >.